This has been a gruesome year for Venezuela. But as our economy collapses, economists are finding it hard to assess just how screwed up we are, since Venezuela’s Central Bank refuses to publish economic data. It’s also becoming very hard to forecast how clusterfucked we’ll be in 2015. This is an interesting proxy for gauging Venezuela’s macro imbalances (how distant we are from macroeconomic equilibrium) and its relative price distortions. The index is actually quite simple: roughly, it’s a ratio that puts the dollars generated from the export of a single barrel at the official exchange rate of 6.3 BsF/USD on the numerator, and the minimum wage on the denominator. So in simple terms the numerator is the amount of money we’re getting from our export sector vis-a-vis the minimum wage in the denominator. Think of it as an indicator of the number of barrels per oil a minimum wage buys (it’s not exactly that – it is an index, and therefore the units don’t matter, what matters is the trend). Think of this in terms of income and expense. The numerator is our income. The denominator is our expenses – the money we have to spend on labor costs. 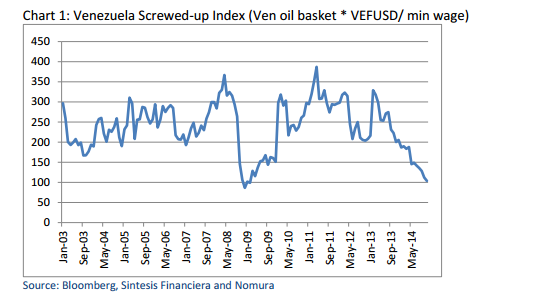 As Nomura’s analysts reveal, the lower the index, the more screwed-up Venezuela is. This is in part because if the index reaches new lows (as it did in the 2009-2010 recession), our purchasing power as Venezuelans has diminished. For 2014 the index is experiencing new lows (we’re more screwed up), as if you didn’t know that already. Surely, Venezuela has a fixed-exchange rate, which means that the numerator fluctuates only on the most important variable that the Revolution can’t control: the oil price. If you take a look on the graph, we’re way past being screwed-up, and the Government is not engaging reality because they’re so darn scared of how its megapopulism will cost them (and us) dearly. Whether the index is a good proxy or not for overhauling the world’s most mismanaged economy, Nomura has to take credit on what we as economists do: maximize an objective function subject to an array of constraints. In plain vanilla, what this means is examine how screwed up we are, subject to the dearth of data, lack of credibility from policymakers and uncertainty among other factors.